Product #16071 | SKU THE RINGER | 0.0 (no ratings yet) Thanks for your rating! Designed for Blue's line of spherical microphones (like The Snowball), The Ringer uses elastics to suspend the mic when mounted on a stand. This dramatically reduces low frequency vibrations that can create unwanted noise (like rumbling from footsteps and vehicles). It also doesn't hurt that The Ringer looks really cool! 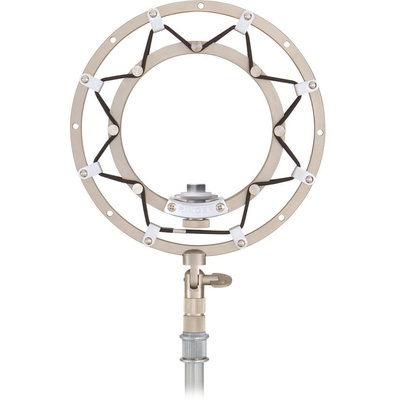 It's compatible with any microphone with a built-in thread mount or a thread mounting clip that fits inside its ring.